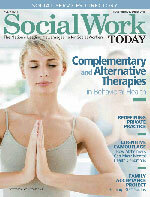 How are complementary and alternative therapies being integrated into behavioral health? For a private practice to thrive in this economy, diversification is a must. Symptoms of Alzheimer’s disease are often similar to symptoms of some mental health conditions such as depression and anxiety. How do you sort it all out? Keep this directory handy throughout the year to help you find the right service, product, or educational opportunity for you. 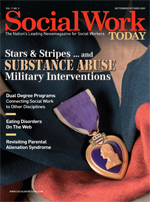 The military is making some progress to improve the treatment of substance abuse among service personnel, but how far can it stretch the limits of confidentiality? Dual degree programs are interdisciplinary ideals. What are the pros and cons for students considering this versatile option? Pro-anorexia and bulimia propaganda infects the Internet and the minds of millions of young women. How can therapists intervene? Critics of PAS theory discuss their views on its lack of empirical evidence and the dangers it could pose to families going through divorce or separation. 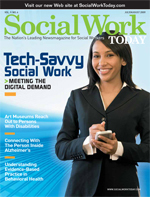 How has technology enhanced social service data management, outcomes measurement, and direct services to clients? Are there any risks? Persons with disabilities benefit from art museum programs that encourage art making and appreciation. What is evidence-based practice, and what are supporters and critics saying about it? Communicating with people who have Alzheimer’s and other dementias can teach care professionals valuable lessons about interacting with respectful, nonjudgmental, positive regard. Learn how healthcare organizations are going beyond language translation to foster better understanding of patients from other countries and create more culturally competent staff. 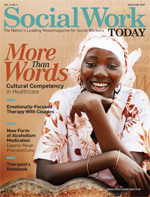 Emotionally focused therapy has been studied and used successfully by social workers who take a strengths-based perspective in working with couples. Balancing the benefits and risks of using medications with clients in recovery is a challenging task, but it’s one that addiction professionals must learn as more and better medications are being integrated into the recovery process. Read the case of a very sexually active young man with severe anxiety and panic symptoms and the discussions of two therapists who review and comment on the case. 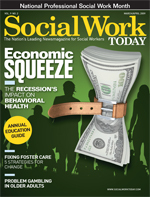 How is the suffering economy affecting behavioral health services? Increasing numbers of people may need treatment, but will they get it? Where is the line between recreation and problem gambling in older adults, and how can social workers intervene when there is a problem? Read the case presentation and discussion of a 25-year-old woman with multiple issues, including substance abuse and possible ADD. Child welfare experts discuss solutions for much-needed change in the foster care system. Find new opportunities in this valuable reference guide to graduate and undergraduate programs. ADHD and Adoption: Is There a Link? Why are some people still uncomfortable with thoughts of older adults and intimacy? 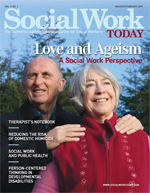 Learn how social workers can support clients in late-life relationships. What interventions at the macro and micro levels could help prevent the deaths of women and men due to domestic violence? Read the case presentation of a woman with serious mental illness and compare your observations with the two therapists who discuss the case. The social work/public health partnership is not new but may see increased interest with the expected changes in healthcare delivery and emphasis on prevention and integrated health and wellness services that a new administration could bring.